Fewer than five per cent of Australians aged under 45 are currently contributing extra to their super. That coupled with a shortfall of $25,000 a year for couples and $20,000 a year for singles between the full Age Pension and what it costs to have a -comfortable' lifestyle in retirement, means Australians need to act now and start boosting their super. According to ASFA's Retirement Standard, to have a comfortable lifestyle, single people need $545,000 in retirement savings and couples need $640,000. At this time, fewer than 20 per cent of single people and 30 per cent of couples aged over 65 are able to achieve this at retirement. Currently, the average super balance at retirement is $292,500 for men and $138,150 for women – a big gap from the current ASFA 'comfortable' level. This is why Money magazine and ASFA have once again joined forces to bring back the Super Booster Day campaign, to highlight the long-term benefits of making additional contributions to super. Money magazine editor Effie Zahos said, 'I've always been a strong supporter of topping up your super and I encourage all Australians to take advantage of the tax benefits it has to offer." 'You can enjoy tax savings if you top up your super using your pre-tax income. These contributions are generally taxed in the super fund at a maximum rate of 15 per cent. In most cases, this tax rate is less than the marginal tax rate. If you can't make regular payments, a one-off after-tax contribution can help you supercharge your wealth," she said. From 1 July, you will generally be able to claim a tax deduction for a personal contribution to super without needing to set up a salary sacrifice arrangement with your employer. ASFA CEO Dr Martin Fahy said Australians should invest in their super to reap the rewards of the magic of compound interest. 'It's particularly important for young people and women to engage early with super," he said. 'It's an ideal way to build wealth and even small amounts can make a big difference in the long term." If you're 40, have $50,000 in super, earn $70,000 a year and only rely on the Superannuation Guarantee, by the time you're 67 you'll have $388,000 in super. * That's around $150,000 less than you need to lead a comfortable lifestyle. So to pay yourself forward and for a range of information, tips, checklists and links to SuperGuru calculators, visit www.superboosterday.com.au before 15 September 2017 and follow the three-step guide to make a pledge. There are also 5 x $1000 prizes up for grabs. By pledging, you can go in the running to win $1000 for your super – simply tell us in 25 words or less what your dream retirement looks like. Question: What is the Super Booster Day campaign? Effie Zahos: I'm proud to announce that the Super Booster Day campaign has returned for another year. Money magazine, in conjunction with the Association of Superannuation Funds of Australia (ASFA), embarked on this initiative to encourage more Aussies to 'pay themselves forward". Our Super Booster Day campaign runs from July 1 to September 15. Fewer than 5% of Australians aged under 45 are currently contributing extra to their super. Maybe this number is so low because we're just not fond of super and the rules keep changing. Maybe it's because we prefer to build wealth outside super or because keeping up with the cost of living is hard enough. Whatever the reason, you can't deny that super is good for building wealth. For most of us it's still the most tax-effective investment vehicle and, best of all, you don't have to add a fortune to reap the benefits. As our creative ads say, 'One less coffee a day could mean $77,602 extra to spend on coffee in Positano in the future." This assumes you're 38 years old and you put an extra $116 each month ($3.80 a day) into your super. We assume 5% over 27 years. This year if you join other Australians and make a pledge to pay yourself forward you go in the running to win $1000 to boost your super. There are 5 prizes up for grabs. Visit www.superboosterday.com.au for details. Question: How can we all boost our super by Super Booster Day? Effie Zahos: Whether it's a regular contribution of $10 a week from your pre-tax income or a one-off payment from your tax refund, it's easy to do. 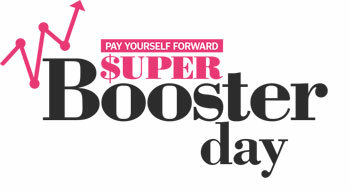 Visit www.superboosterday.com.au before September 15, follow the simple steps and pledge to pay yourself forward. You'll find plenty of great tips and tools to help you understand your super more. Question: Why is it especially important for women to boost their superannuation? Effie Zahos: Put simply women tend to live longer than men, making it even more important for them to accumulate enough super to last through retirement. Throw in the fact that they earn on average less than men; they take time out of the workforce to raise children or care for aged parents; and they may run a single-income household after a divorce and you can see why it's an uphill battle for women to grow their nest egg. Question: At what age should we consider contributing extra to our Super? Effie Zahos: Contributing extra (pre-tax dollars) into your super, also known as salary sacrifice makes good sense if you earn more than $37,000 a year. That's because you're taxed at a rate of 34.5% (includes the Medicare levy) and your pre-tax contributions would only be taxed at just 15%. If you earn less than $37,000 an after-tax contribution may be a more effective way to boost your super because you may be eligible for a co-contribution from the government. It's best to get some advice from a financial planner or by calling your super fund. Of course the earlier you start the better because you have the advantage of time and we all know that compound interest works amazingly when you have time. Just remember though $25,000 is the maximum you can salary sacrifice each financial year and this includes what your employer puts in. Question: Should the amount we contribute increase as we age? Effie Zahos: As you get older you tend to earn more but your expenses get bigger too. Typically you're paying off a mortgage, paying for school fees and maybe even helping your aging parents so it is understandable that putting extra into your super is a challenge which is why the sooner you can boost your super the better. Certainly, retirement experts typically tell you that you need a great deal of money to live well in retirement. Some say 70% of your pre-retirement income, and $1 million is frequently mentioned. Others point to the Association of Superannuation Funds of Australia (ASFA) retirement standard figures for a comfortable retirement lifestyle. ASFA says a couple who own their home need $640,000 in super ($545,000 for a single). If you are a renter in Sydney, you need savings of $1.16 million (couple) and $1.04 million (single) to provide enough income to support a comfortable lifestyle in retirement. You'll find more details about how much you need to retire on the Superboosterday.com.au website and it's worth talking to an expert if you need help getting there. Question: How do we go about contributing extra to our Super? Effie Zahos: There are two ways you can voluntarily top up your superannuation fund; either by making concessional super contributions such as salary sacrifice or non-concessional (after-tax) super contributions. Salary sacrifice involves forgoing some of your salary to make extra contributions to your super account, instead of receiving it as part of your take-home pay. You can talk to your employer to set this up. Take care though as there are maximum amounts that you can contribute. More details at www.superboosterday.com.au. Question: Are you surprised most Australians don't know their superannuation balance? Effie Zahos: I get the frustration surrounding super. There are probably a million other pressing money issues you have to deal with right now before you can even think about the future and of course the government keeps making changes. Whenever I become disillusioned about super though I always take it back to square one. Is it still tax-effective and do I have time on my side? Despite the changes super still offers amazing tax breaks for most of us. While I don't intend super to be my only strategy to fund my retirement it does play a major role. The tax perks are the reason. On a 39% marginal tax rate (including 2% Medicare) you'd pay $390 on $1000. However, if you salary sacrifice the $1000 into super you'd pay just $150 because contributions are taxed at 15%. Why give the tax office an extra $240 when you can 'pay yourself forward" by putting it into your super fund. Question: Why is it critical that we are aware of our superannuation balance, fees and contributions? Effie Zahos: We have to remember that it is our money. If you had tens of thousands of dollars sitting in a bank account there's no way you would forget about it. Your super account is just the same as your bank account – it's just that you can't access it until you're about 60 (depending on the year you were born). Having said that it's important that you're not paying too much in fees, that your returns are good and compare well with similar funds and you have the right amount of insurance in your fund otherwise they could all be having an effect on your returns. It's worth calling your super fund as most provide free or low-fee advice. Or you could talk to a financial planner.